On November 20th, 2015, a celebration on this matter took place in about 8 primary schools and kindergardens of our group of schools. 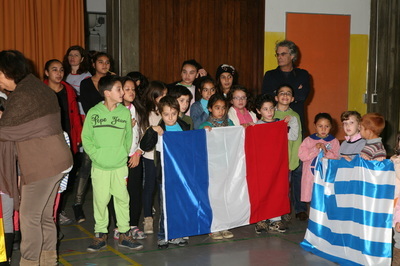 It was a joint activity of the schools, parish Hall and City Hall. 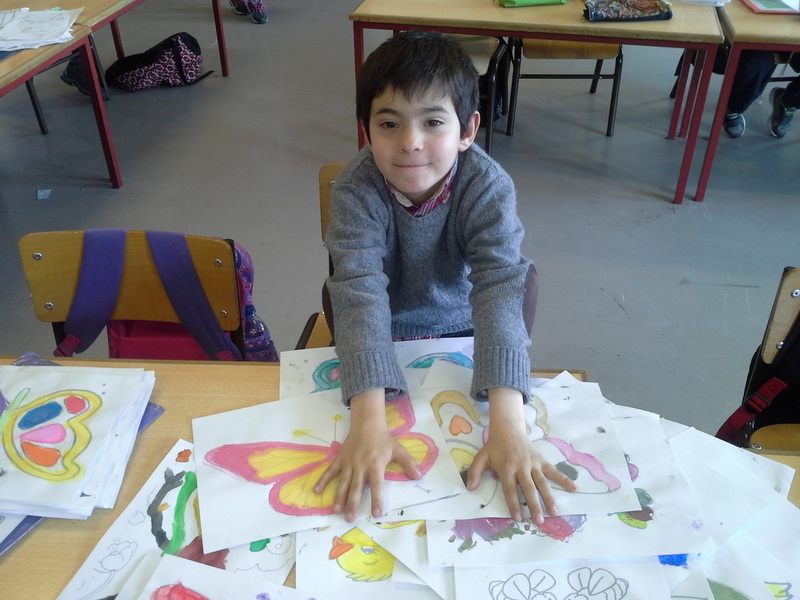 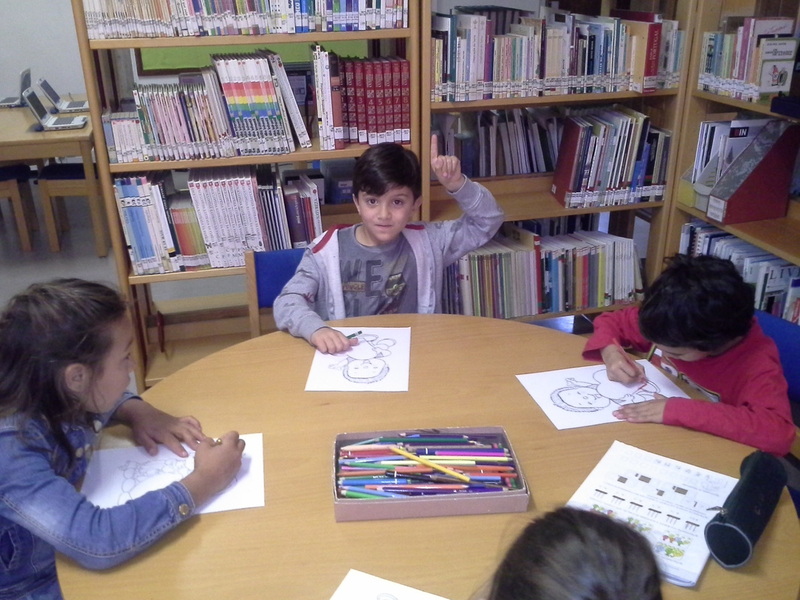 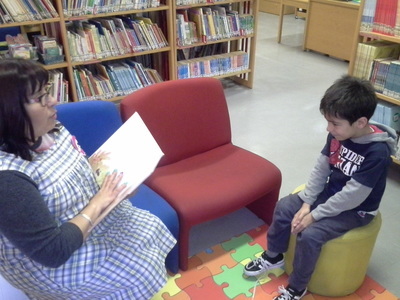 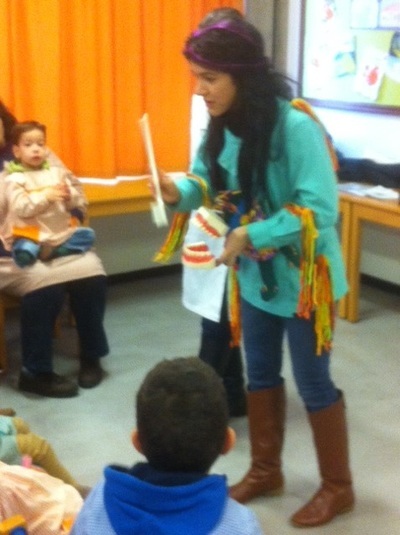 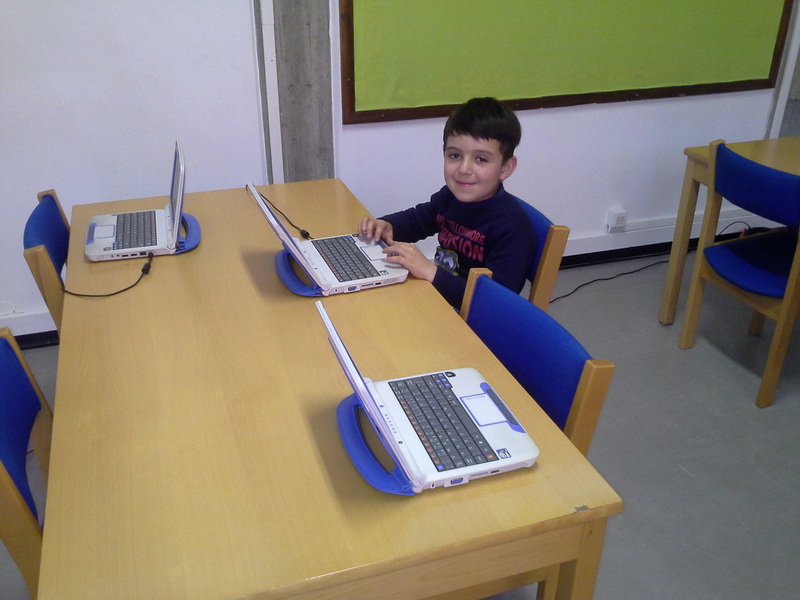 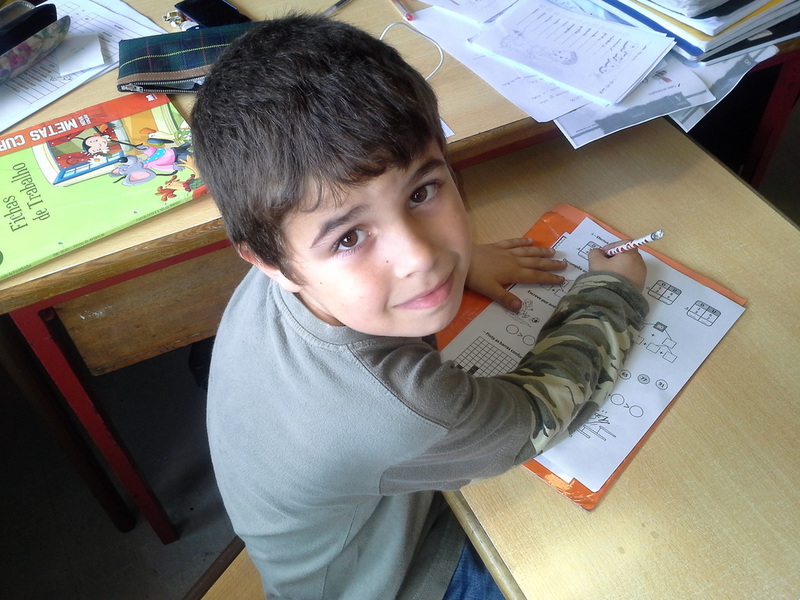 Here below you can see aspects of the cerimonies held at Templários School and Valdonas School. 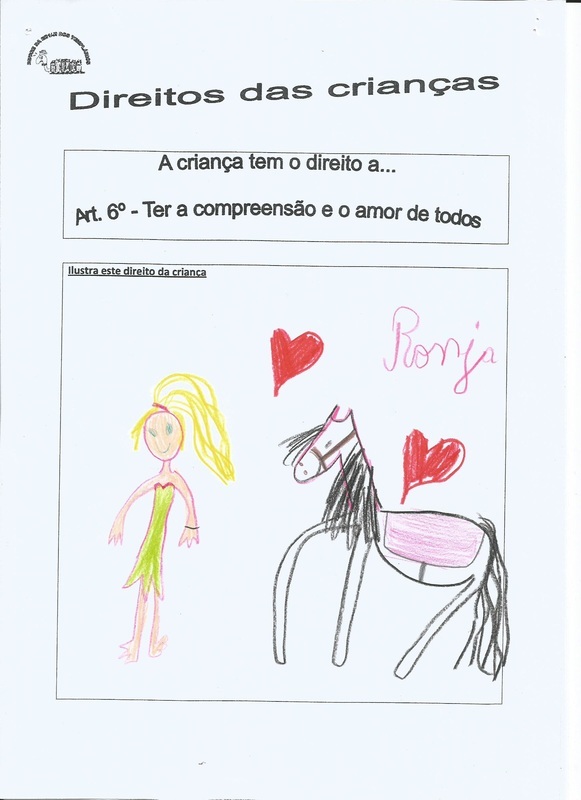 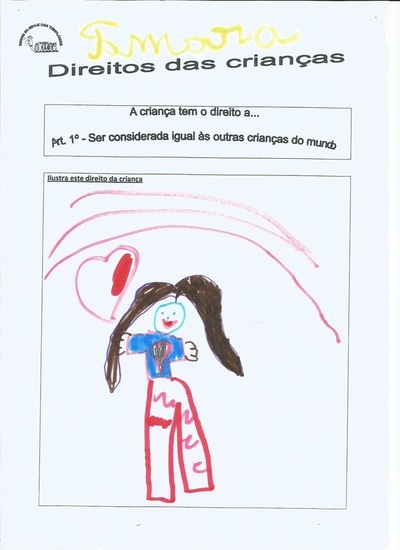 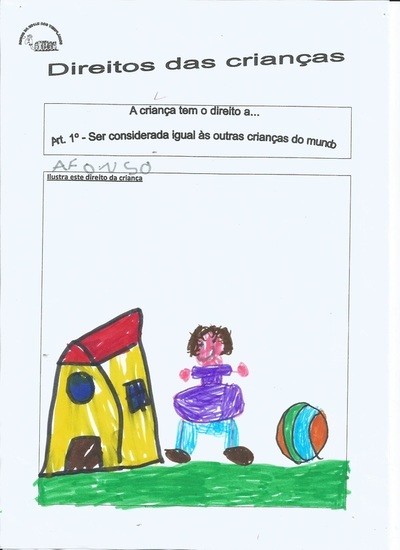 Templários School children's drawings about Children's Rights and aspects of the cerimony. 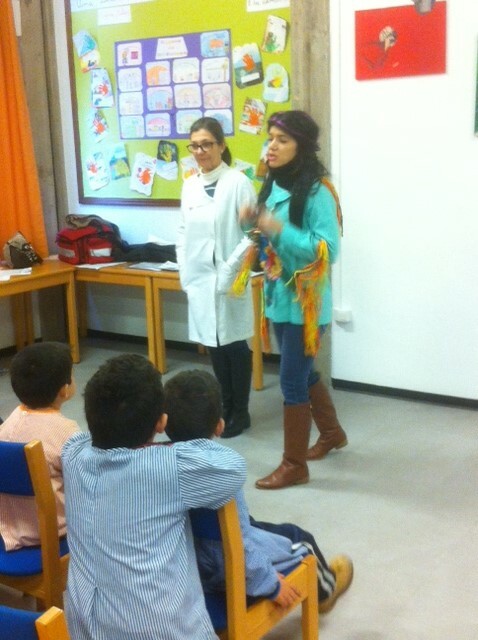 The act at Valdonas School. Trying to give some dental health suggestions to the families, a meeting with kindergarden pupils's mothers and a medical doctor took place at Templários school. This initiative was decided taken also in consideration the module citizenship of our project, on the sense of something to be done on behalf of our common future as a community. 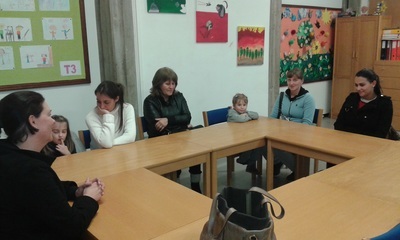 The general director of our group of schools was also present. 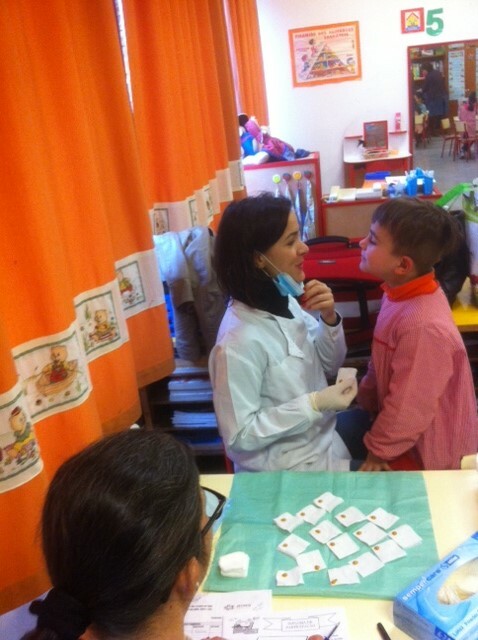 From January 2015 to April 2015, in cooperation of one of the local health departments, all the primary schools of our group of schools (about 450 pupils involved) had sessions about health advices. 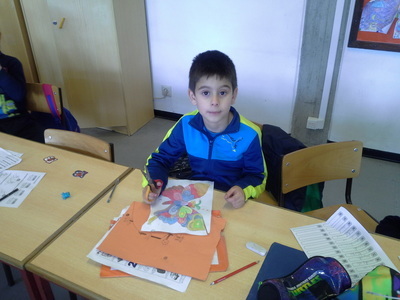 For us, Citizenship is also the melting of cooperation of public authorities (as it happens with other activities displayed on this website, like Police Department, local medical doctors and Municipal Environmental technicians) and our pupils. It has long term results. Templários school CLASS T1 (boys and girls aged of 6 years-old) reforests a pinewood on the outskirts of the city with the help of local authorities, and fire department. A good day to all of us. 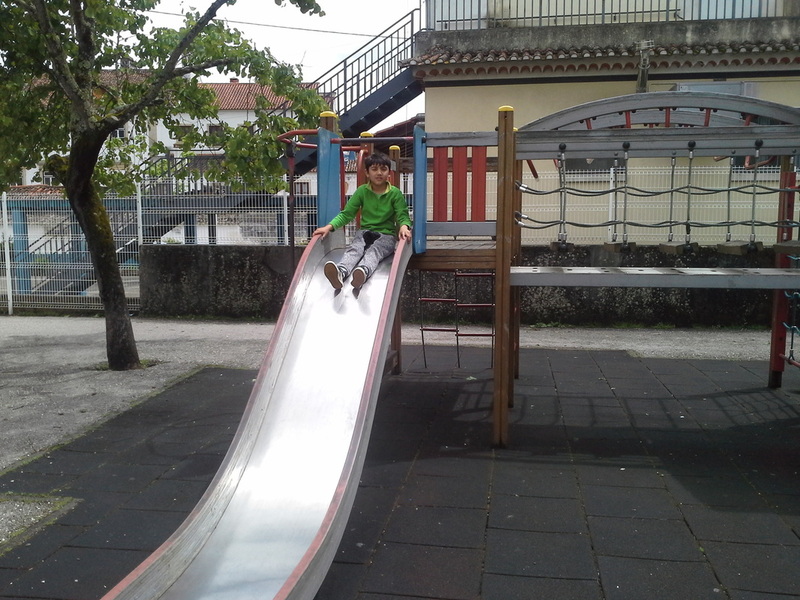 Next to our school there are some hills coverd with vegetation, bushes and trees. 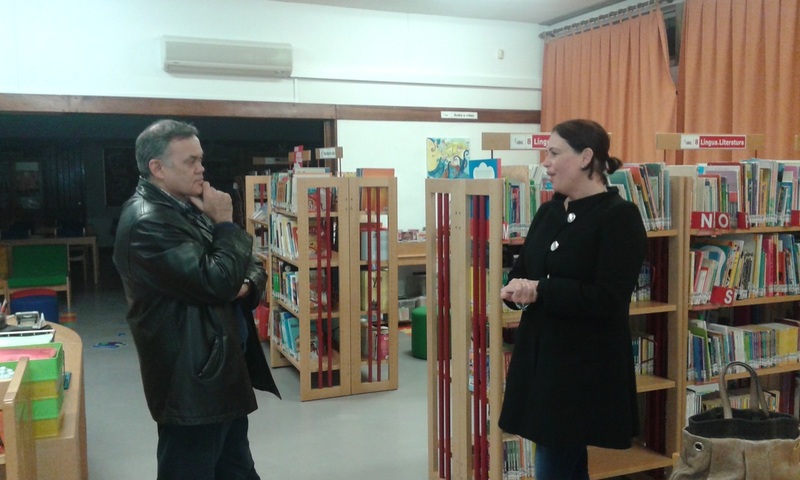 In one of those hills there used to exist a lote of pine trees, but the age and some fires have damaged the pinewood. 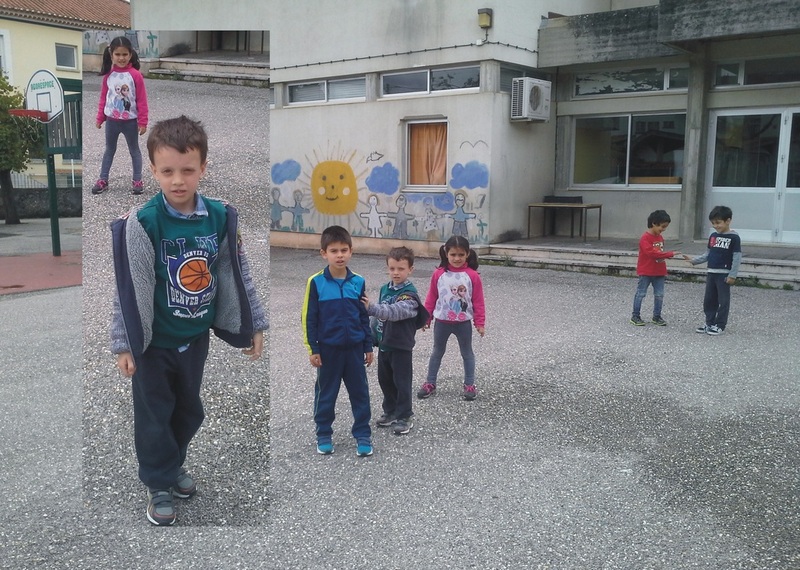 … on the January 14th 2015, all our class’ children walked from school to the nearby St. Bárbara Pinewood (this is the name of the pinewood). 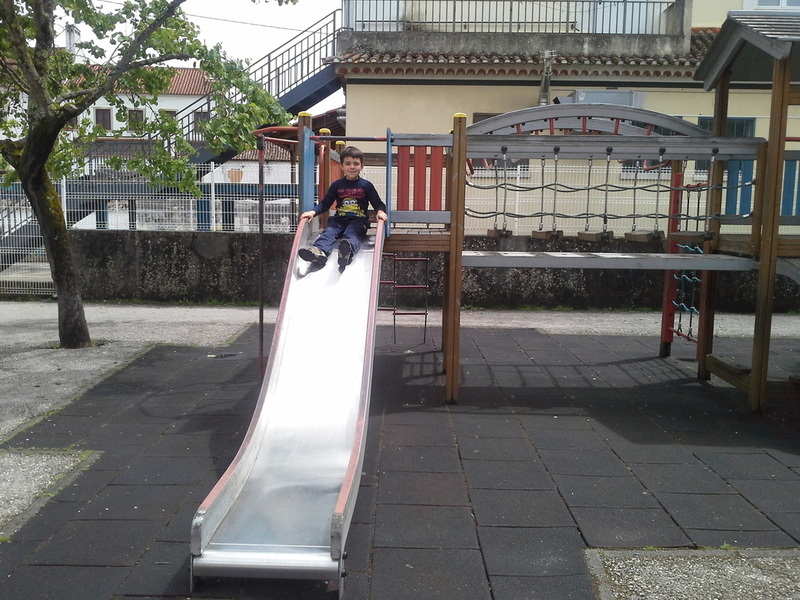 We were not alone: the policemen and firemen walked with us for safety reasons, since we had to step two dangerous part of our itinerary: firstly, a piece of road with sidewalks; then, a very steep climb on the pinewood itself. The day was cold and rainy, reason why everything had to be done very cautiously. Nevertheless, we were happy because our task was about to begin: planting little pines in several places of the pinewood in order to reinforce the number of trees. 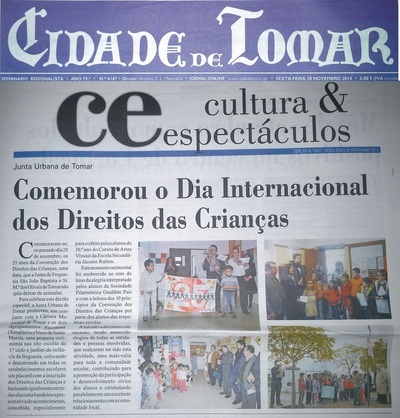 As we arrived, the gentlemen of the City Hall and the Civil Parish (both elected politians and workers to help us on the digging and planting) received us with as much joy as we had. 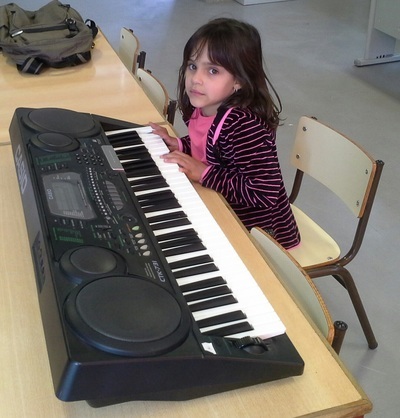 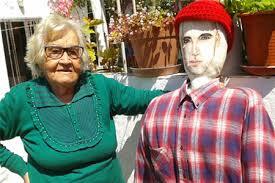 Our teacher, Mrs. Marília, organized us all in groups of two pupils and we manage to lant 15 little pines. We did love so much this activity! 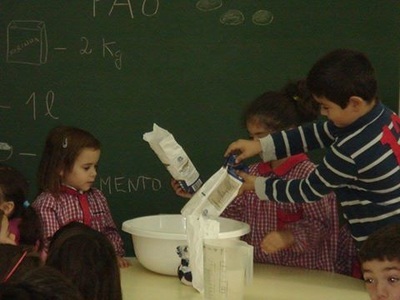 We were aware that, although we are still little children, we are giving our best to the future of our planet. 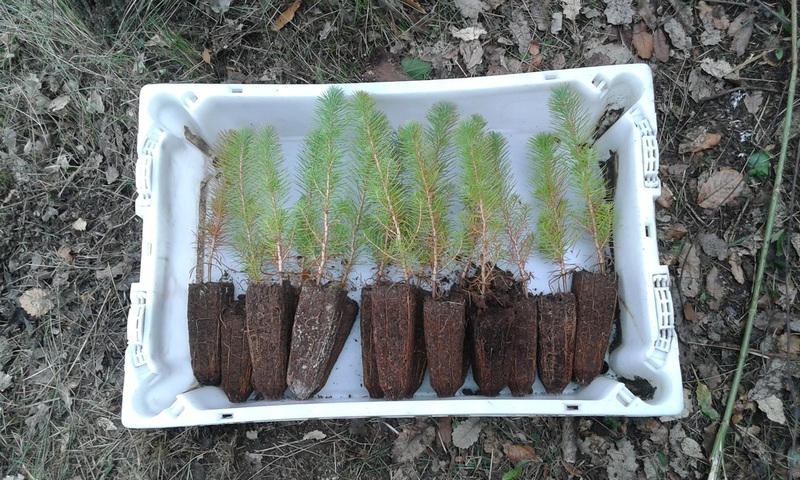 We loved this idea of reforesting the pinewood and, by doing so, preserve the environment. 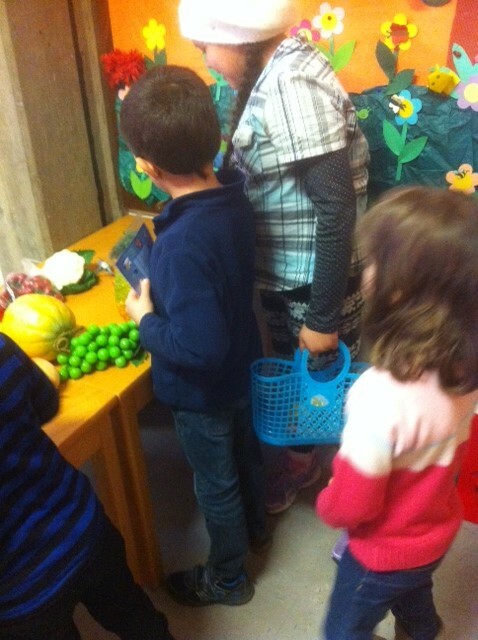 We thank to all the grown-ups who’ve helped us. ​Falco is a very friendly character chosen by the Police Department to teach children how to behave or to deal with situations of daily life: how to ride a bike, how to deal with unknown adults approach, how to behave at home, and many other matters. Falco tells a lot of stories with the help of police officers. 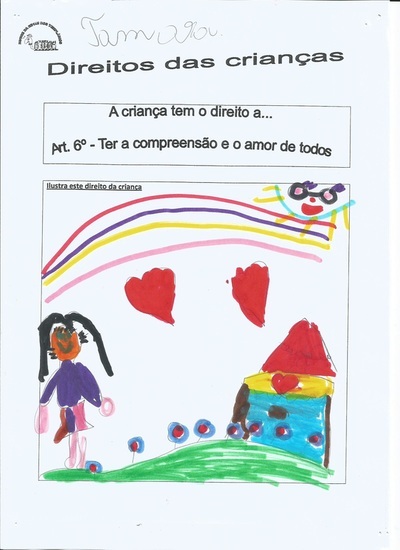 That happened three times at Templários school with the presence of our so very well known officers Dolores, Ferreira and Aparício. All 8 classes, from kindergarden to 4th graders were present in different sessions along the days. They come often to our school and and are very good friends of ours. 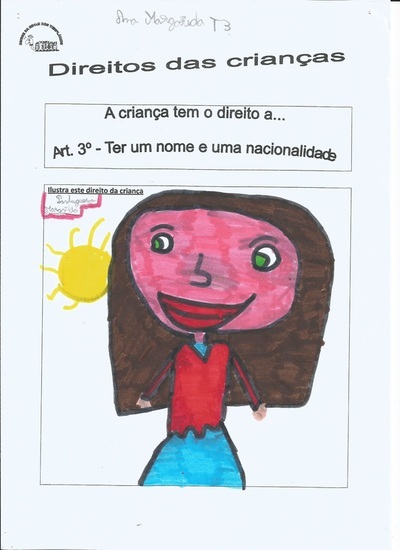 Concerning the national portuguese “Programme for Inclusion and Healthy Life”, several institutions, among them the Portuguese National Plan for Ethics in Sport, has organize together with our school some activities for all the primary school pupils, on the 20th of May 2015. 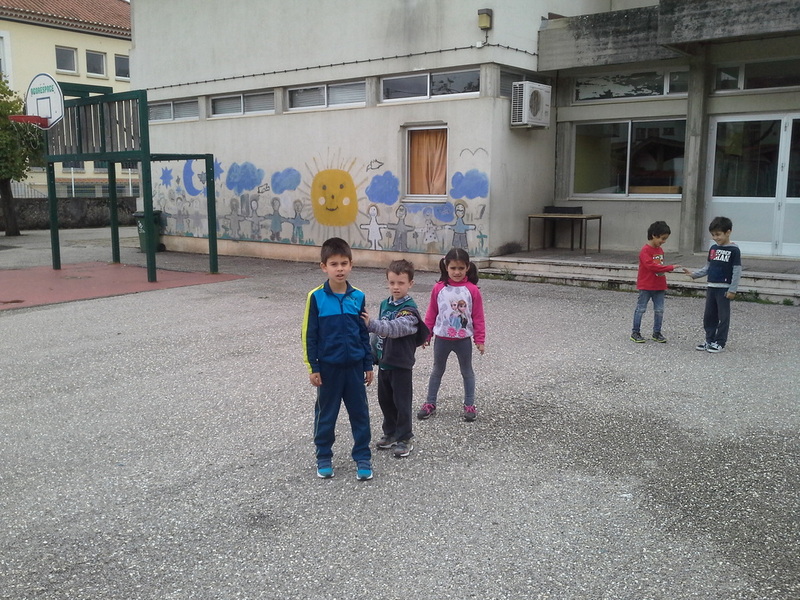 After those sessions, the main idea kids recorded on their minds was that Sport is worthy more because of companionship and practice then results themselves. 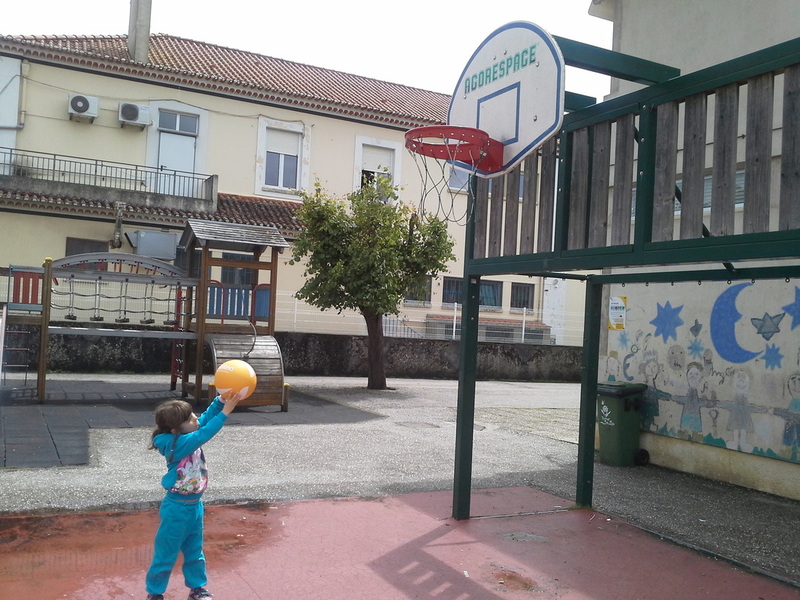 Making friends and struggle for a common goal are key components of Sport. 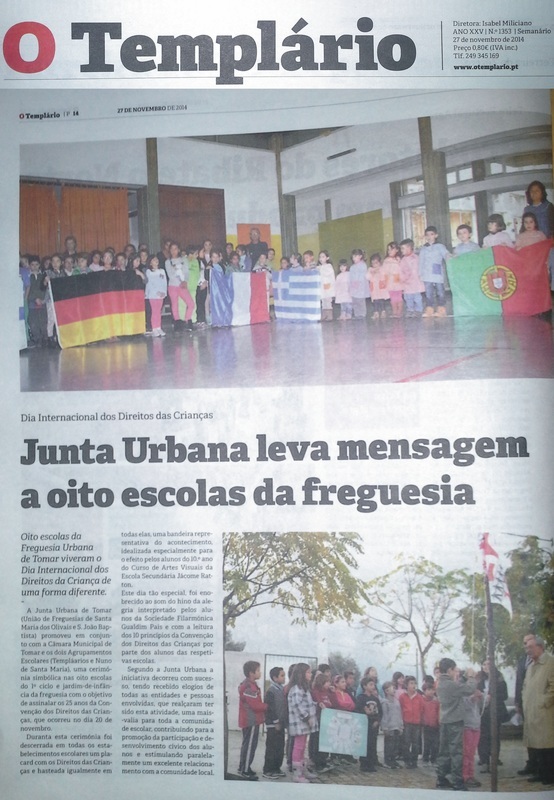 The school thanks for one more activity on our Erasmus Project having been possible with the cooperation of local and national institutions, such as the above mentioned the Portuguese National Plan for Ethics in Sport and the local Police Department, through the officers Dolores, Aparício and Ferreira, who, once more, came to our school for this event. Templários primary School, in Tomar, is one of the places in the city where the citizens vote on general and local elections. 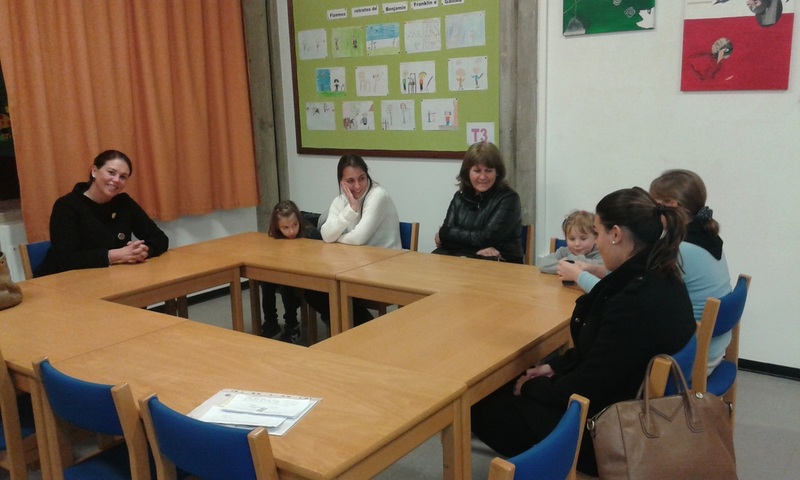 As in other countries, the school, on the Sunday voting day, is open to all voters. 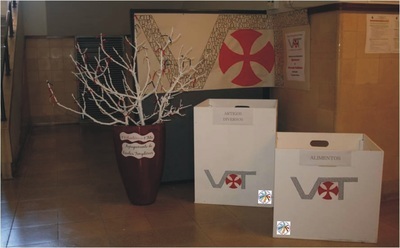 City Hall is in charge of providing the voting boxes and the hidden desks for the voters to write their choice on the voting bulletins. 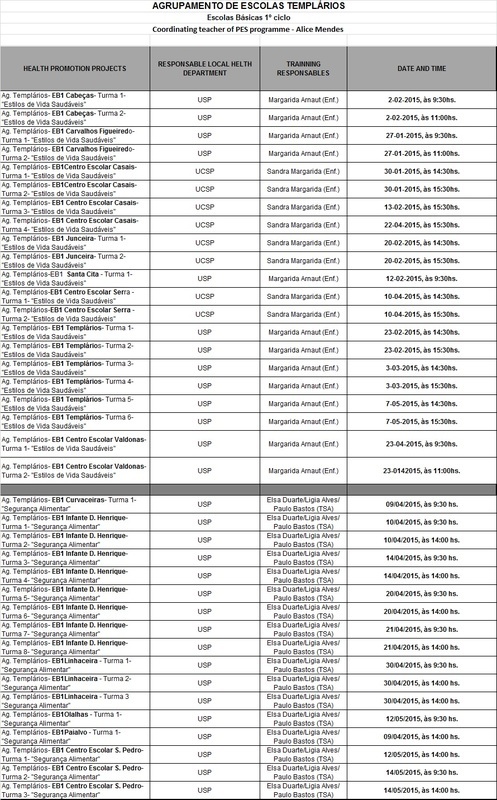 That usually happens on the previous Friday to the voting Sunday. 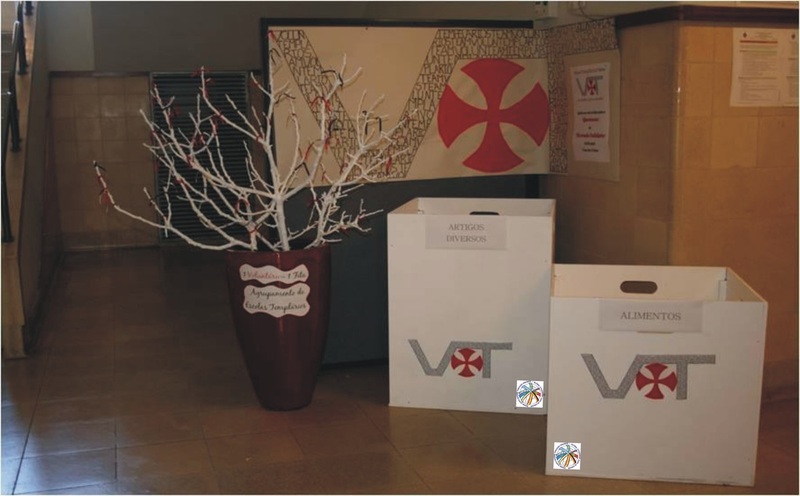 Last October 2015, on Friday the 2nd, our school was already equipped with those voting instruments. 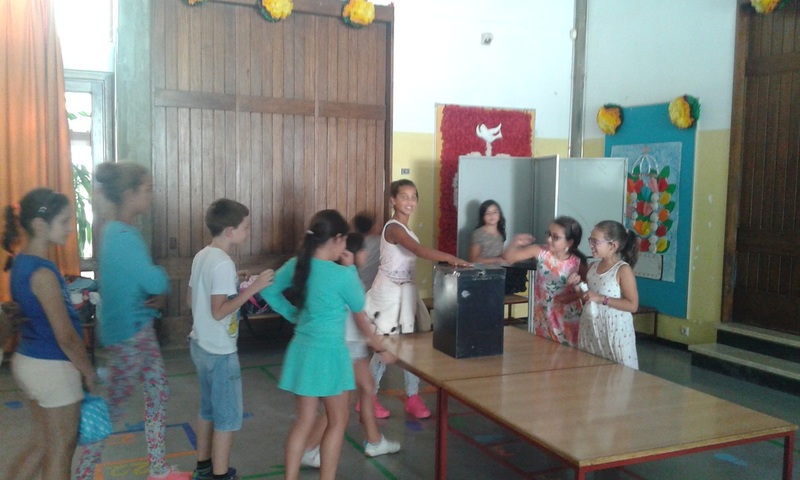 So, the 4th grade pupils tried to dramatize a voting session: the voters queue, the members of the voting tables, the placing of the vote inside the voting box. 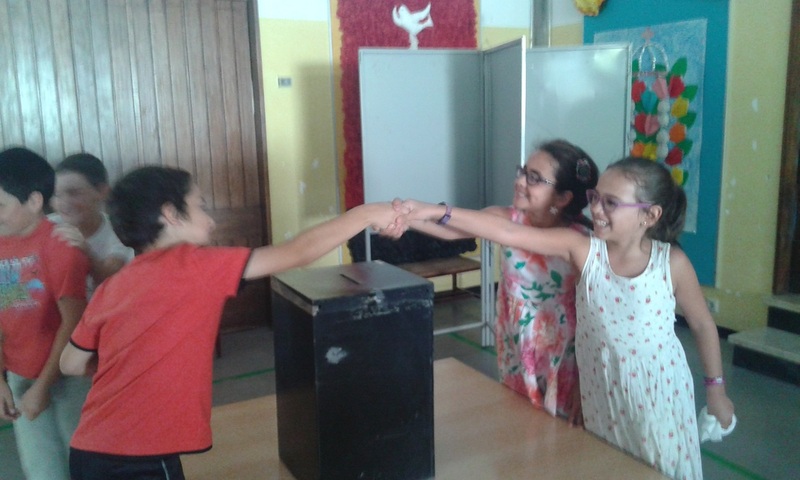 It was an excellent way for pupils to realize how a real voting session works. 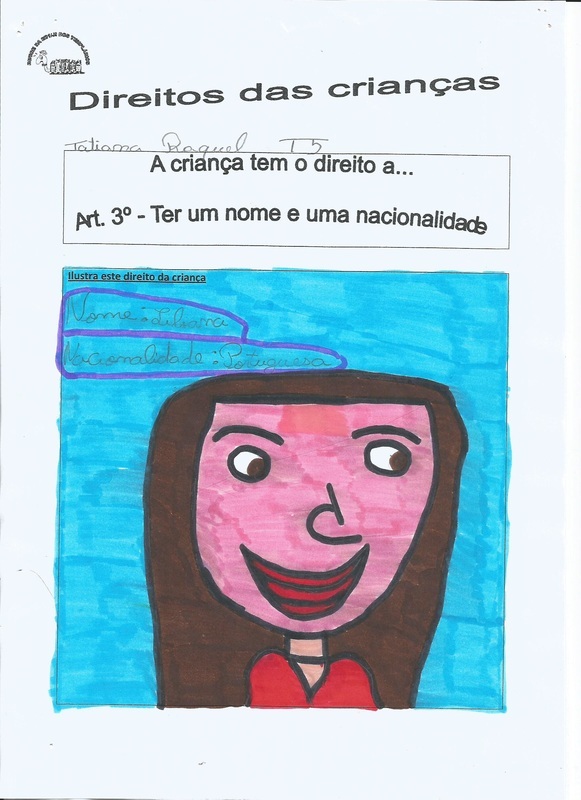 Santa Iria School 6th grade pupils have been invited to use their talents and creativity to translate in visual messages some fundamental values on Global Citizenship. 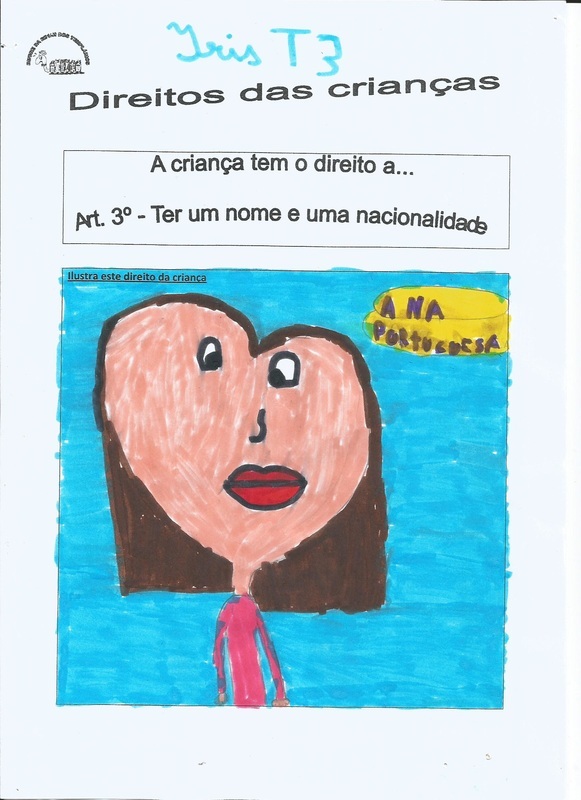 To begin with, they had to think on the meaning of the word “citizenship” so that they might understand that citizenship consists on the social way of being with Human Rights as the base of everything, namely the values of equality, democracy and social justice. 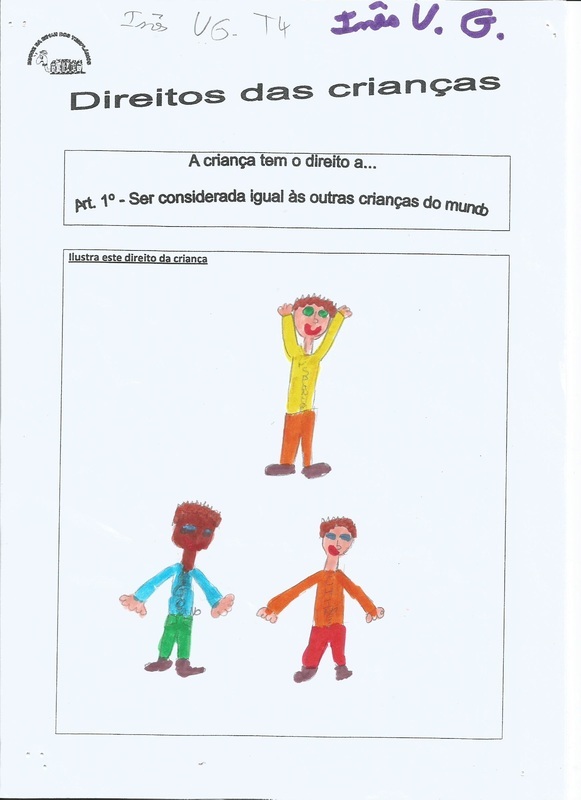 The debate started with the visualization of strong images leading the pupils to concepts and realities such as freedom/slavery, child work, torture… The aim was the social dialogue, the respect for other peoples’ opinions and the conscience of a critical and creative democratic spirit. As a result of this debate, pupils started linking their personal thoughts and practices with those images as well as the never ending new on the human rights violations. 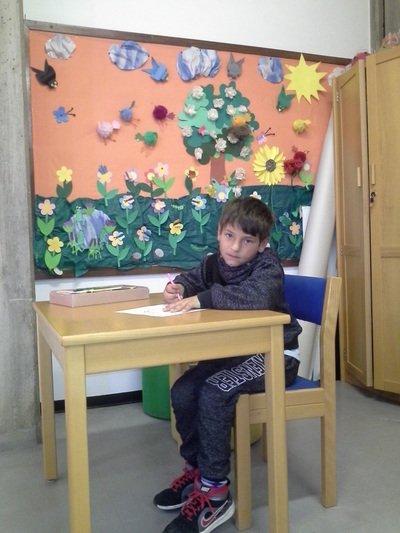 They felt particularly shocked with the wars and the sea migrants that have to run away from their homes seeking for shelter in Europe. And they wondered about the way they are received in some countries and their futures. 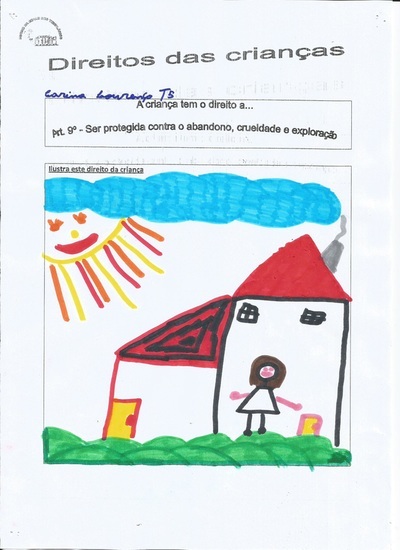 On the same registration, images of women and children sold and slaved, forced to prostitution and to work endless hours without any school and the warmth of a family made them think deeply. 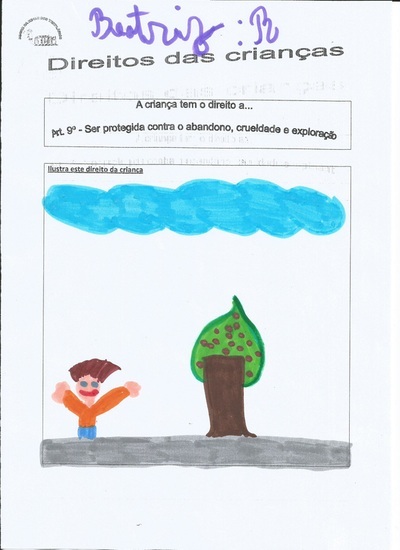 The activities could not finish without a reflection on how they might act to defend and promote the fundamental liberties, the attitudes to better have when facing with injustice and discrimination and what to do to show solidarity and help. It was very interesting to see their ideas coming to the surface of their spirits, some of them real solidarity initiatives. And… with all those ideas they painted the values of global citizenship. 6th Grade pupils of Santa Iria School and 4th Grdae pupils of Templários schools have contributed with their works for the project general newsletter on Decomcracy and Citizenship. Page nº 5 was their contribution as it might be seen underhere. As it had happened last school year, the police agents came again to Templários School to talk how to behave in society. 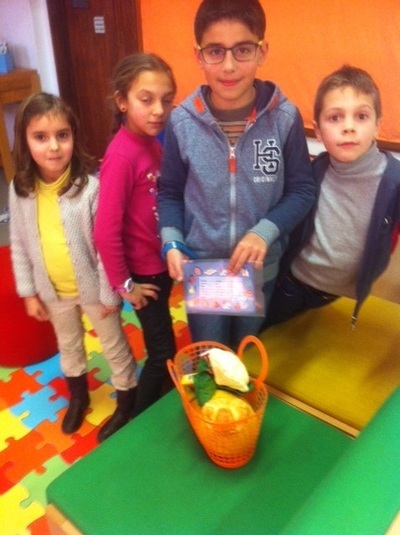 They came with another story with the character FALCO, a very friendly character chosen by the Police Department to teach children how to behave or to deal with situations of daily life. 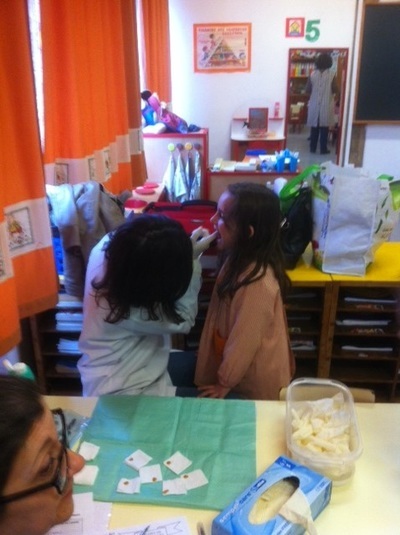 This time the theme was FRIENDSHIP. A balanced life meand a balanced food policy. 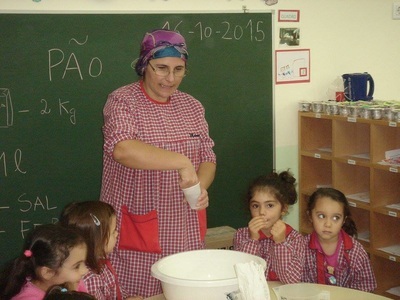 That is why Santa Iria School pupils, under Mrs. Gaudência artistic supervision, the Natural Sciences Group and the group for Educate for Health, promoted several activities concerning this theme. 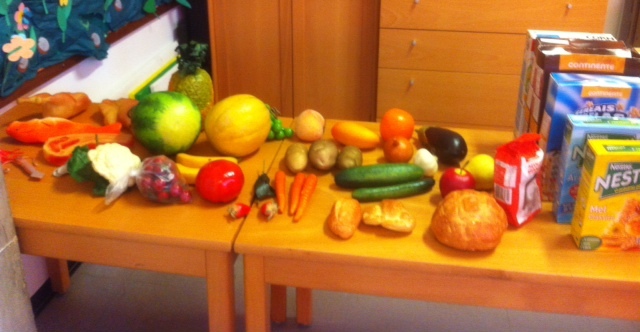 This happened during thje celebrations of World Day for Food. 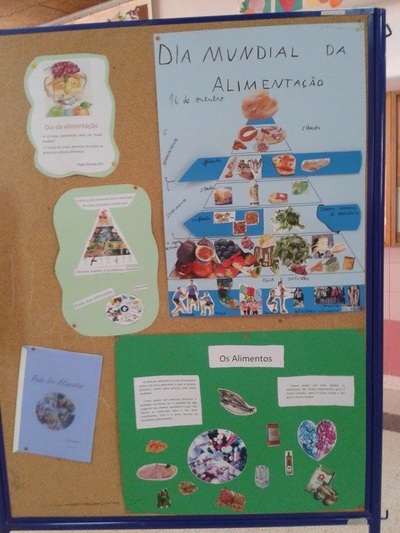 Uma vida equilibrada pressupõe bons hábitos alimentares. Nesse sentido a Escola Básica dos 2.º e 3.º Ciclos Santa Iria empenhou-se, como é seu apanágio, na comemoração deste dia através de inúmeras atividades promovidas pelo Projeto Educar para a Saúde do Agrupamento Templários, dinamizada na referida escola pela professora Graciete Gaudêncio, que contou com a colaboração dos docentes de Ciências Naturais dos 2.º e 3.º Ciclos, por alunos do 6.º ano e com a participação dinâmica e inovadora na abordagem da referida temática, por parte dos alunos da turma B do 9.º ano. A par destas atividades informativas e lúdicas, cumpriu-se o habitual dia das sopas: houve sopas para todos os gostos e todos gostaram das sopas. 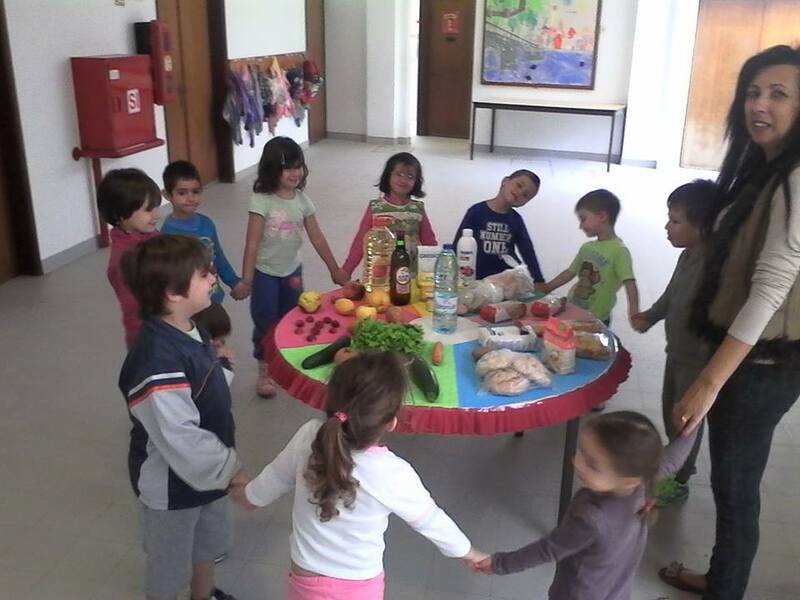 ﻿Abou the very same day of International Day of Food, another schol of our group of schools has done some practical work on the subject. 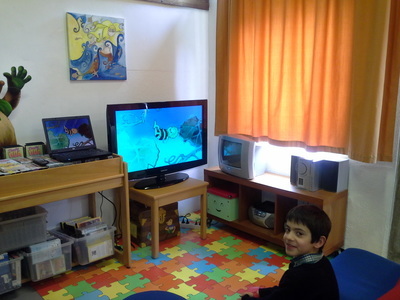 In this case it was the school of VALDONAS. 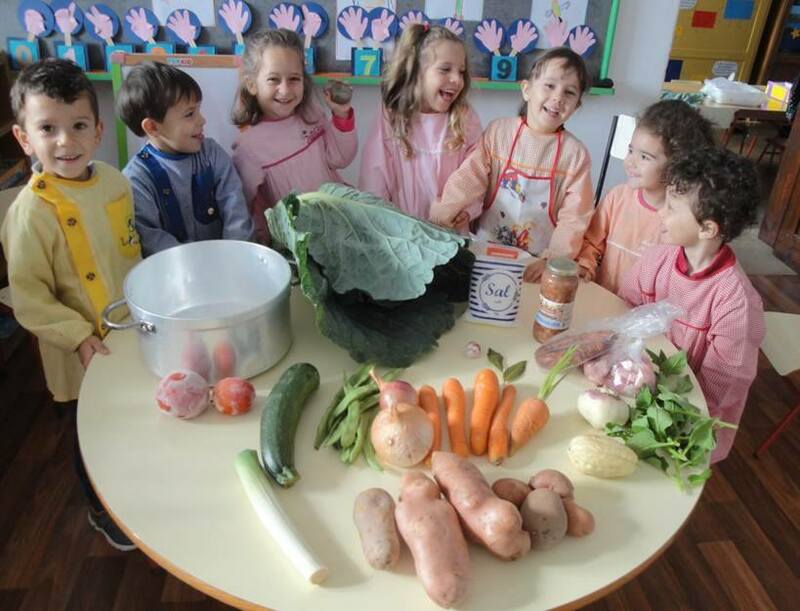 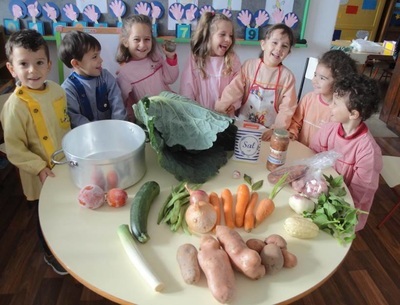 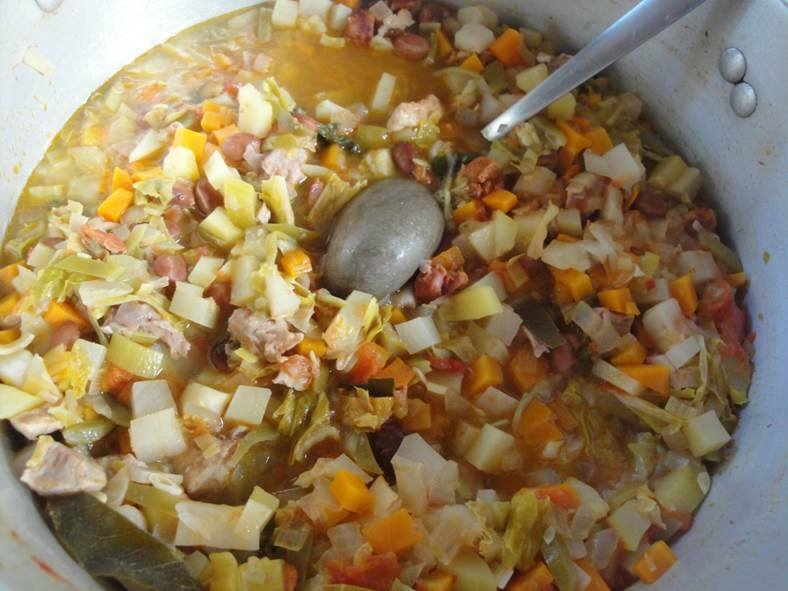 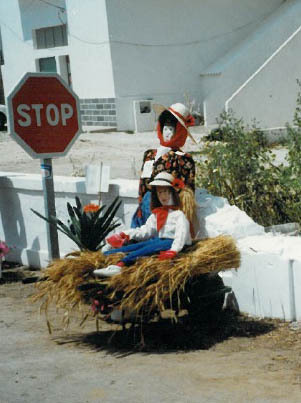 The same happened in the Fetal Kindergarden, where kids and grown-ups produce a traditional Portuguese soup. 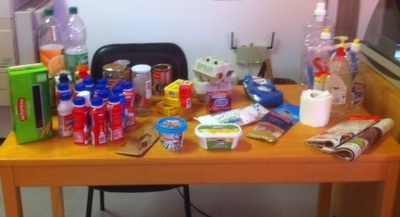 In another school of our group, the work was about the food wheel. 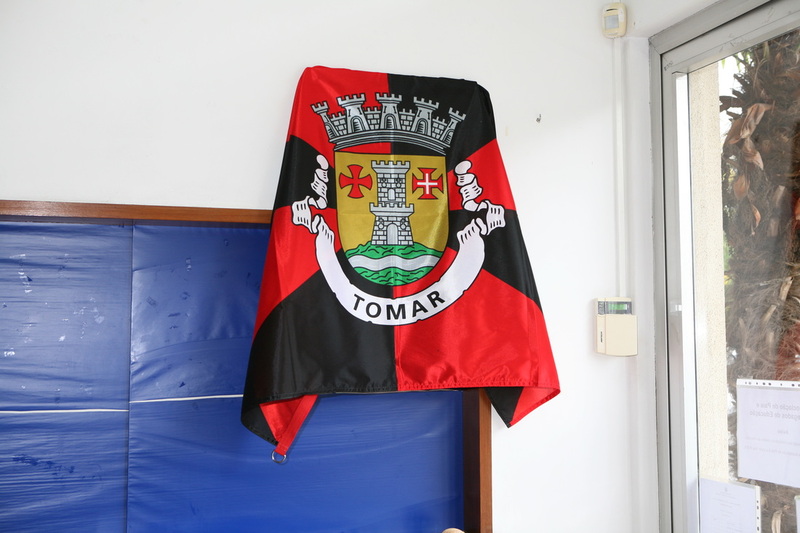 Including themes as Food Hygiene and Healthy Food, the Health Center of Tomar was present in all our Primary schools (Cabeças, Carvalhos de Figueiredo, Casais, Curvaceiras. 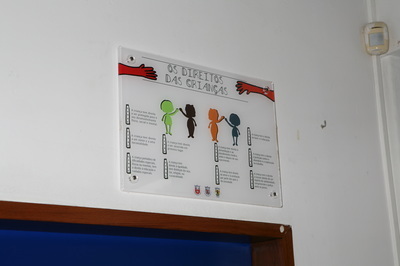 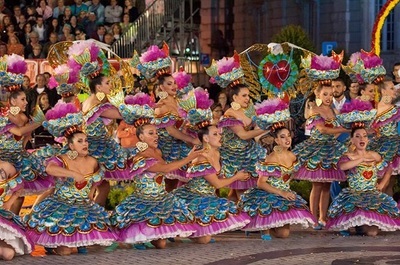 Infante D. Henrique, Junceira, Linhaceira, Olalhas, Paialvo, Santa Cita, S. Pedro, Serra, Templários and Valdonas) in 30 activities for more then 600 pupils. 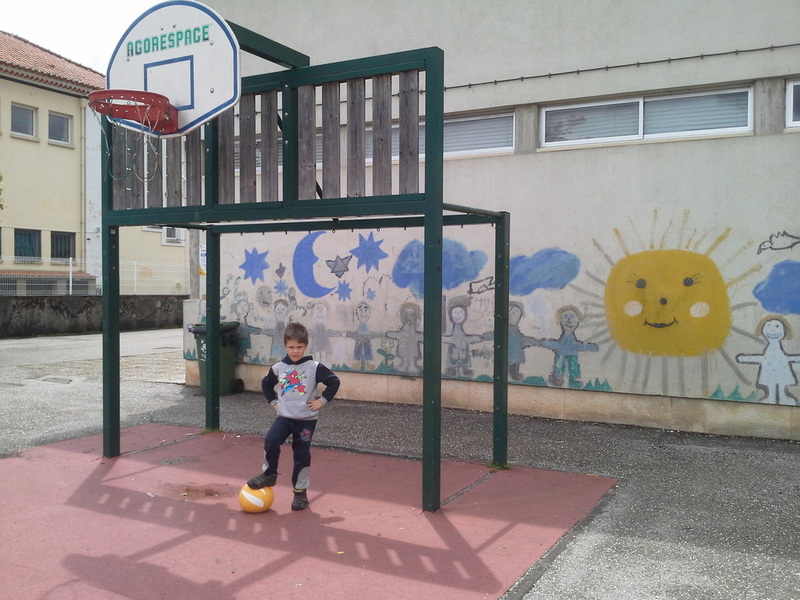 This way, as it hapened last yschool year, the heathcare as a citizenship factor was present on our Erasmus Projectwith the partcipation of local health authorities. 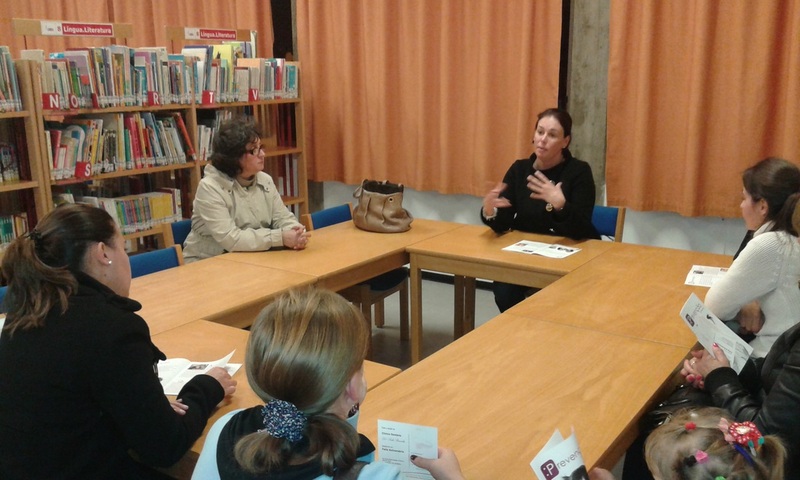 Nurses and health Technicians were Margarida Arnaud, Heloísa Oliveira, Sandra Margarida and Sandra Ferreira. 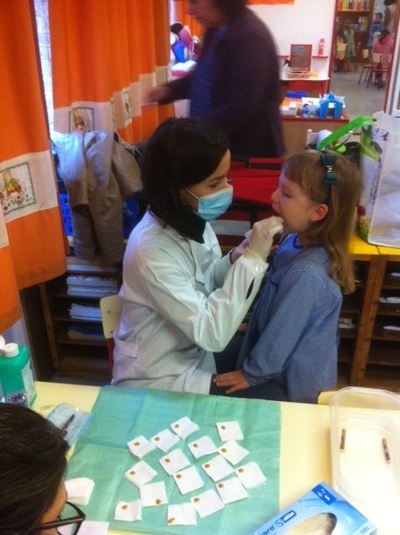 In the begining of January, as it had happened last year, health technicians came to Templários school. 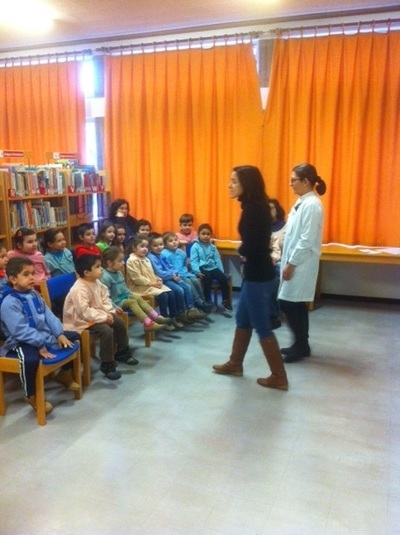 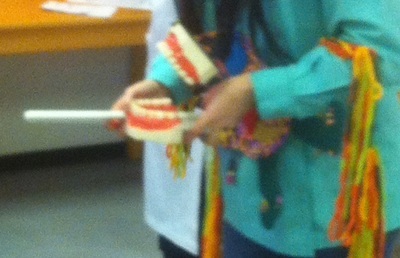 This time to interact with kindergarden school on what conccerns to the health of children's little teeth. The same happened in all the other 13 kindergarden of our Group of School, with a total of 14 different sessions corresponding to 262 pupils. The team of nurses was composeb by Margarida Arnaut anf Oral Heloísa Oliveira. 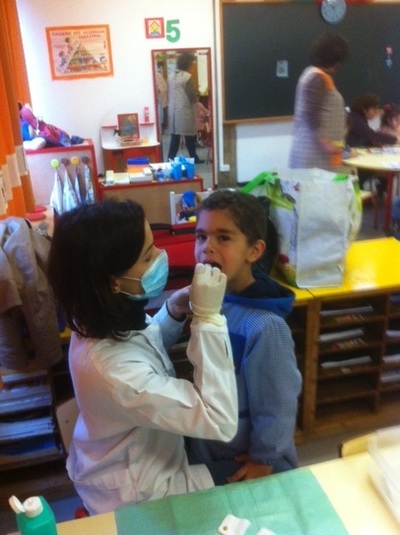 A Enfermeira Margarida Arnaut e a Higienista Oral Heloísa Oliveira da Unidade de Saúde Pública do Centro de Saúde de Tomar dinamizaram uma sessão de educação para a “higiene corporal/higiene dentária” para os alunos do Jardim de Infância. 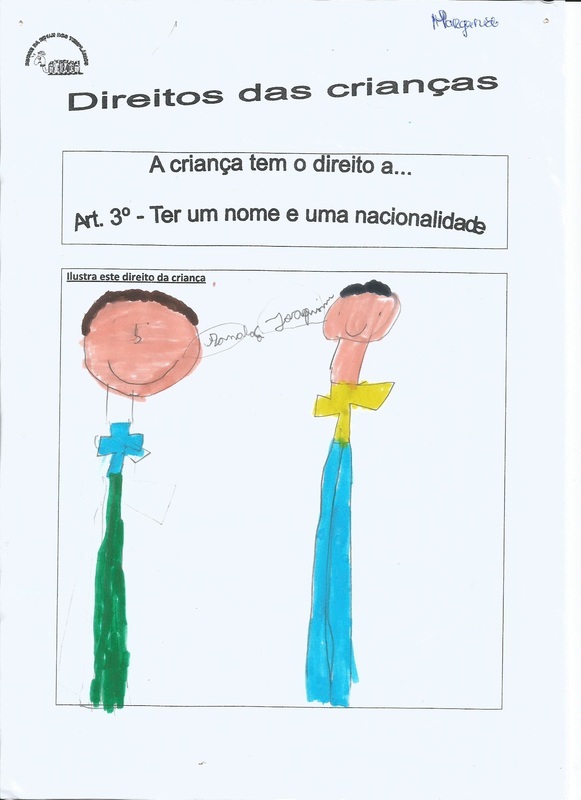 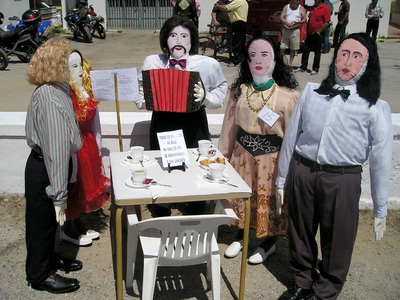 Foi feito um pequeno teatro com a enfermeira e a higienista devidamente caracterizadas! 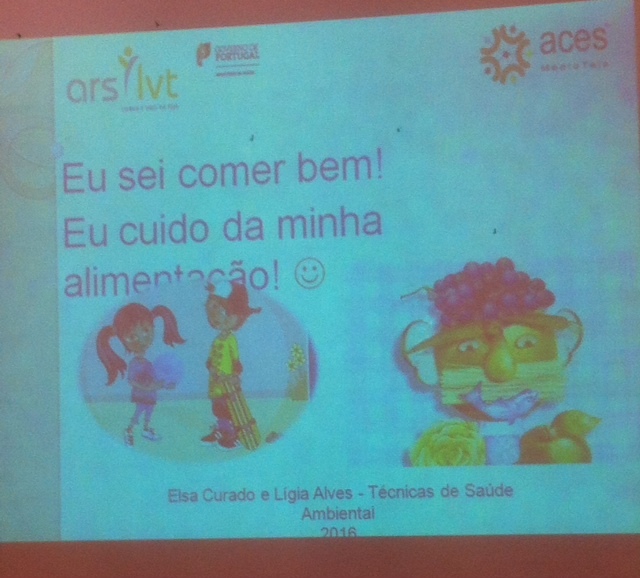 As crianças gostaram muito e estiveram muito atentas e interessadas às explicações que iam sendo dadas sobre bons hábitos alimentares e higiene dentária! Após a sessão foram aplicados os vernizes de flúor aos alunos do Jardim de Infância! 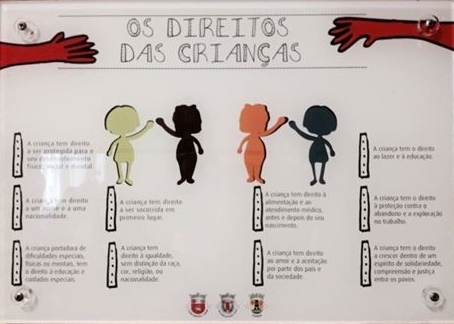 Todos os meninos estiveram bem dispostos e sorridentes! 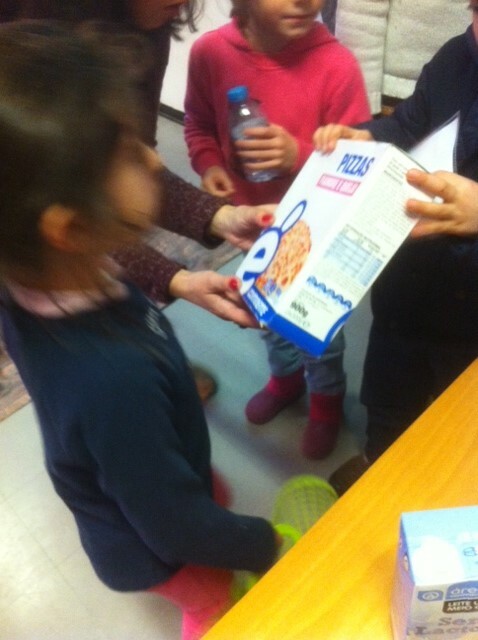 Another team of the Tomar Health Center visited Templarios School to tell kids the best way to organize products at home, the time they must be used, reading lables and understanding security information. 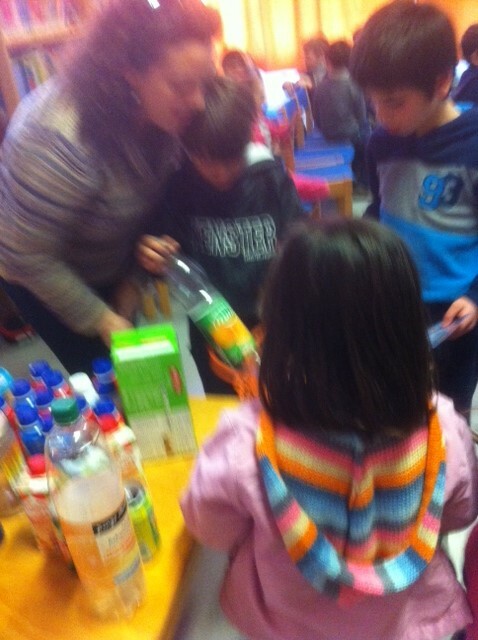 This was organized for all the 6 primary classes at school in 6 different activities during 2 days. 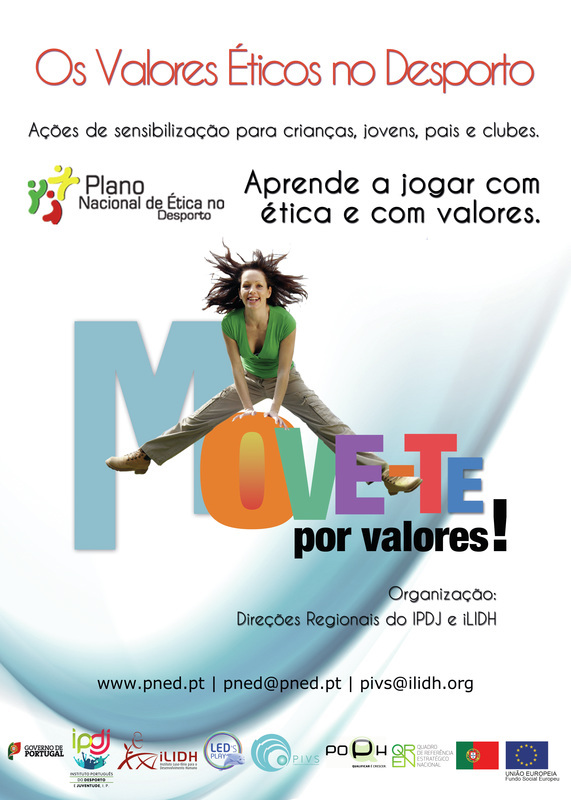 BE SOLIDAR; MAKE YOURSELF A VOLUNTEER! 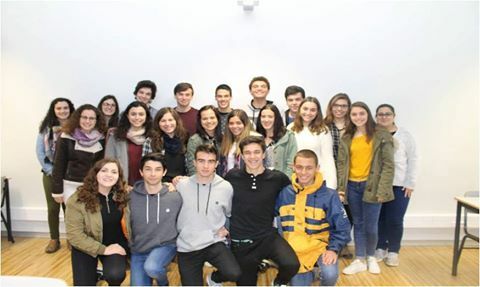 Secondary students (11th grade) of Jacome Ratton School participated in a programme YOUNGVOLUNTEAM that was held all over the country with the support of Government entities and the Presidency of the Portuguese Republic, as well as the Portuguese public bank. This was a program in which class E of the 11th grade was the embassador class of this project. 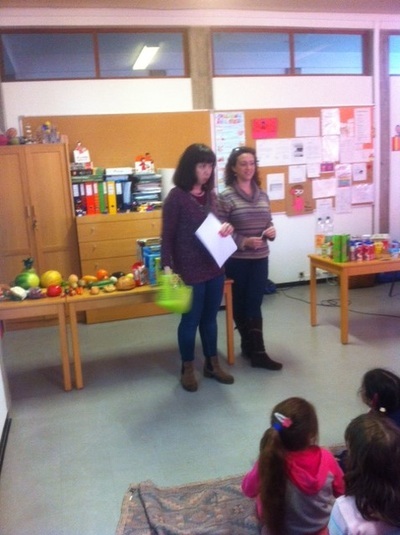 Several activities took place: Support to the Families, Sodidarity Meals, Blood Givings and others. 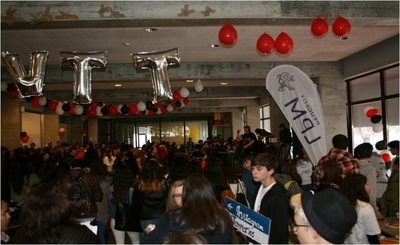 On the 15th March there was a campaign day to ask for donation with the envolvment of the students association in other to prepare the items to be given to the Solidarity Fair to take place one month later, as we will see in another post. This activity and the solidarity fair were integrated on the Erasmus Project. 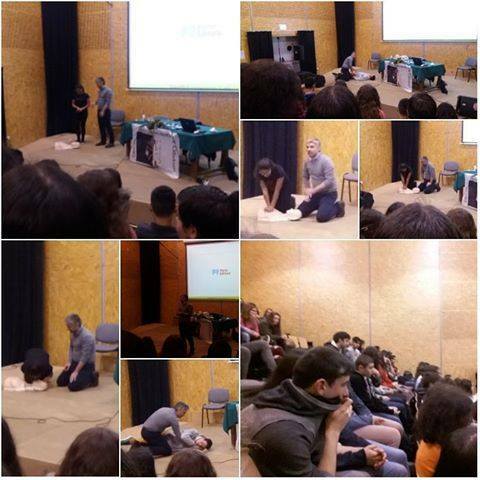 For 9th graders of Santa Iria School and Gualdim Pais School, a trainning activity on Basic Life Suport held by external specialists took place in the big auditorium n the 14th april 2016. 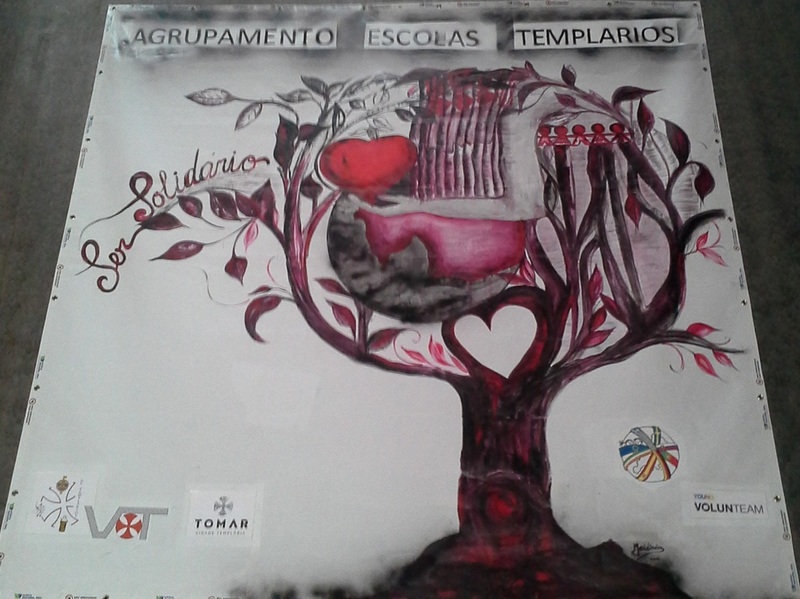 Templários Group of Schols deciided that the then´me to the banner that the partnership decided to make in each country according to their realiyies took the form of a big banner that was used also to advertize the Solidarity Fair (two days in Aptl 2016 - 15th and 16th) held in municipal facilities. 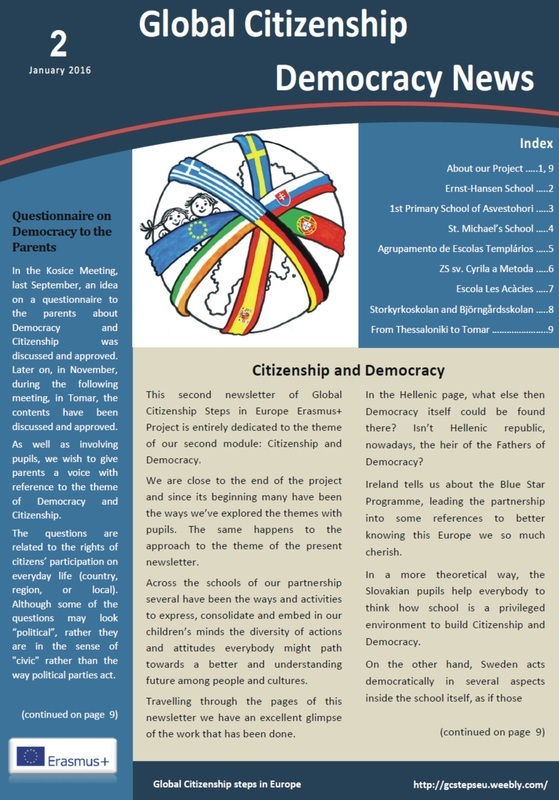 You may see images of this fair on CITIZENSHIP page. 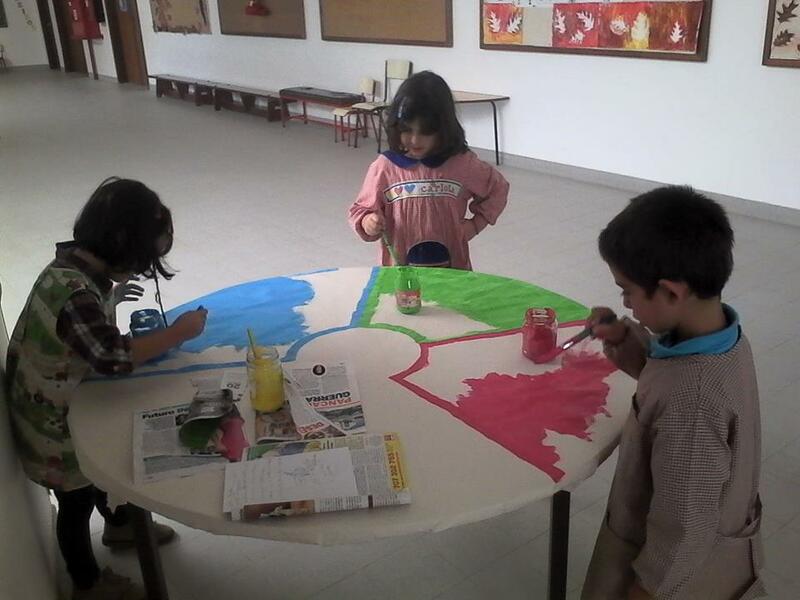 This has also to do witth the activity of VOLUNTEAM. 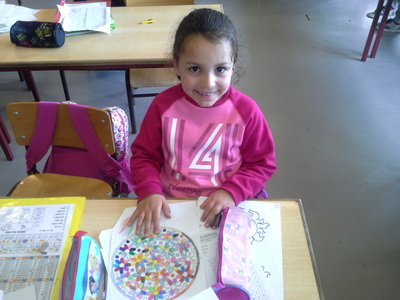 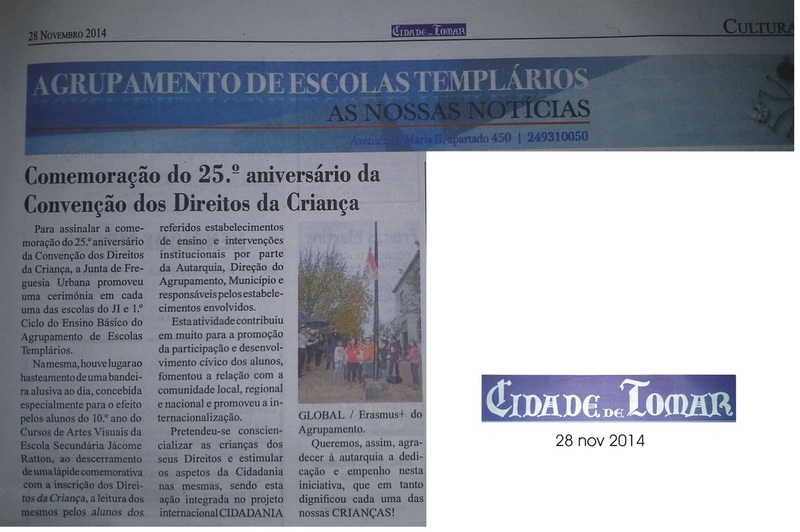 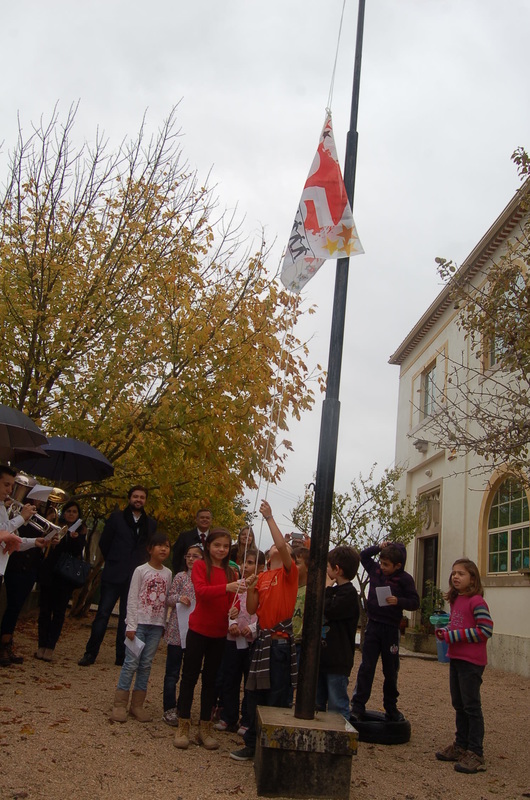 The banner was created in Santa Iria School, under Mrs. Gaudêncio supervision. 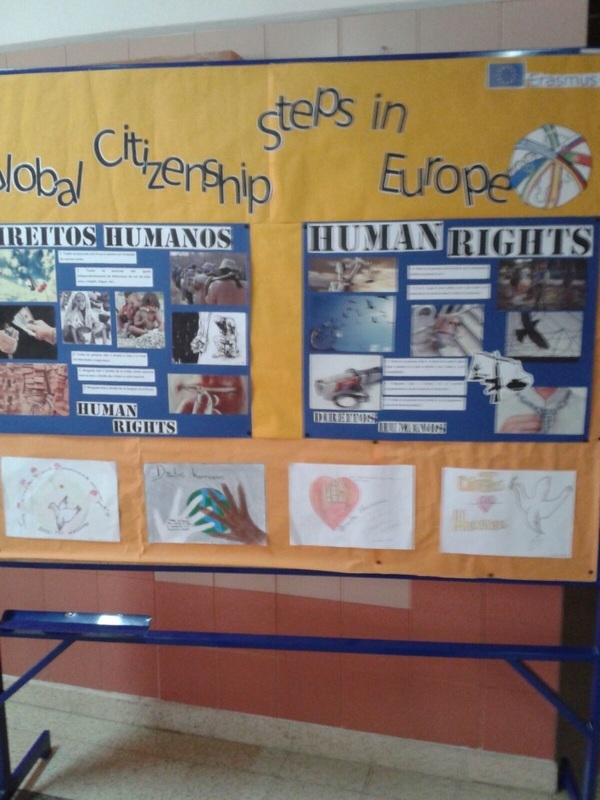 This was also a dissemination activity on our Erasmus Ptoject on the theme of Solidarity / Citizenship. 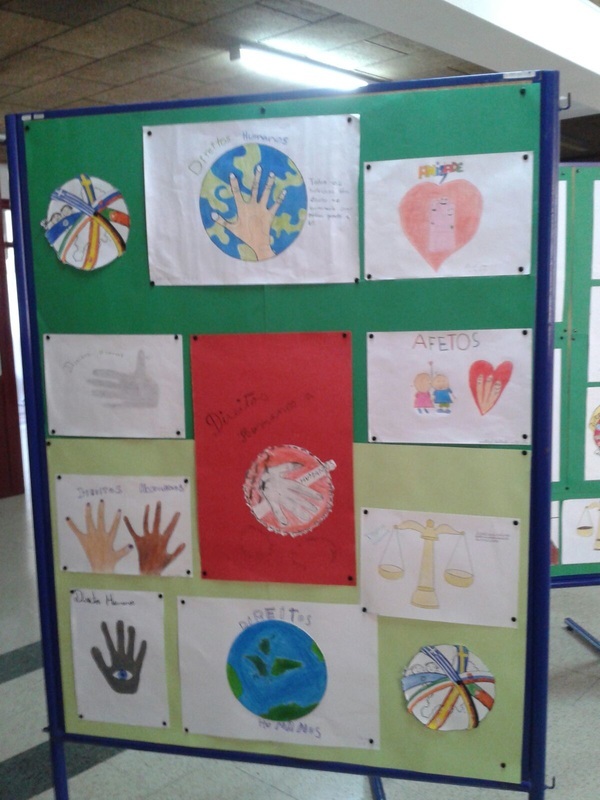 Following the activity of the secondary students (11th grade) of Jacome Ratton School held on the 15th March (see prevoius posts), a two days public Solidary Fair was held in municipal facilities, in the city centre with the presence of local, civil and religious authorities. 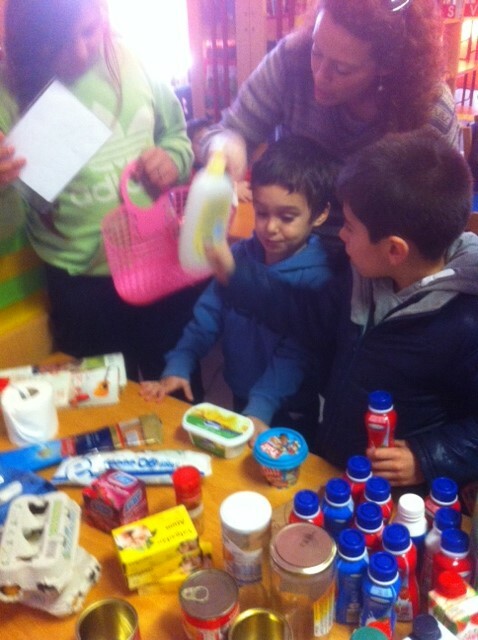 The fair was a place to donate blood ang goods, to distribiute former received goods, used clothing trade, selling of cakes, flowers and plantes to get funding for further solidarity activities. 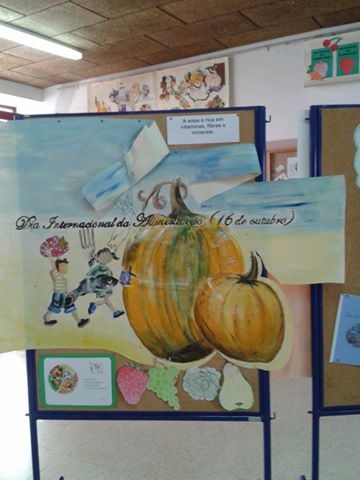 The BIG BANNER of the project was decided to be the BANNER OF THE EXIBITION. 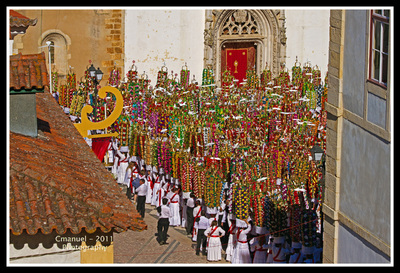 You may see also the banne on Dissemination part of this site. 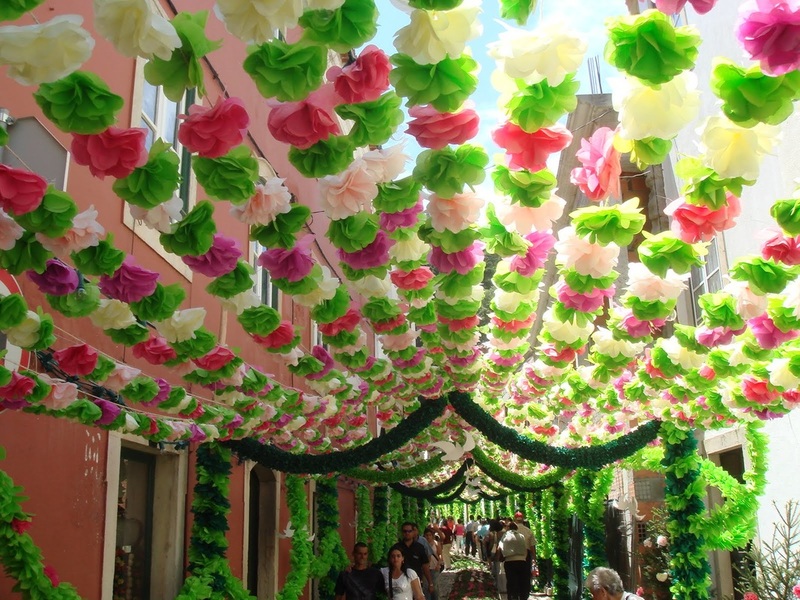 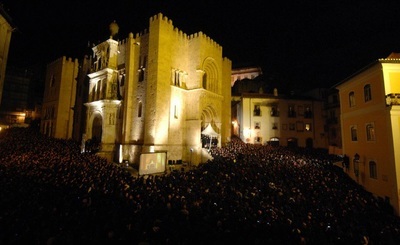 On May Portugal celebrates the day of the heart. On the 18th May, anniversary of our head school, all the kindergarden, primary schools, secondary schools and high school of our group of schools organized a global activity, coordinated by Gualdim Pais school, with the double goal of celebrating the anniversary but mainly to celebrate heart health. 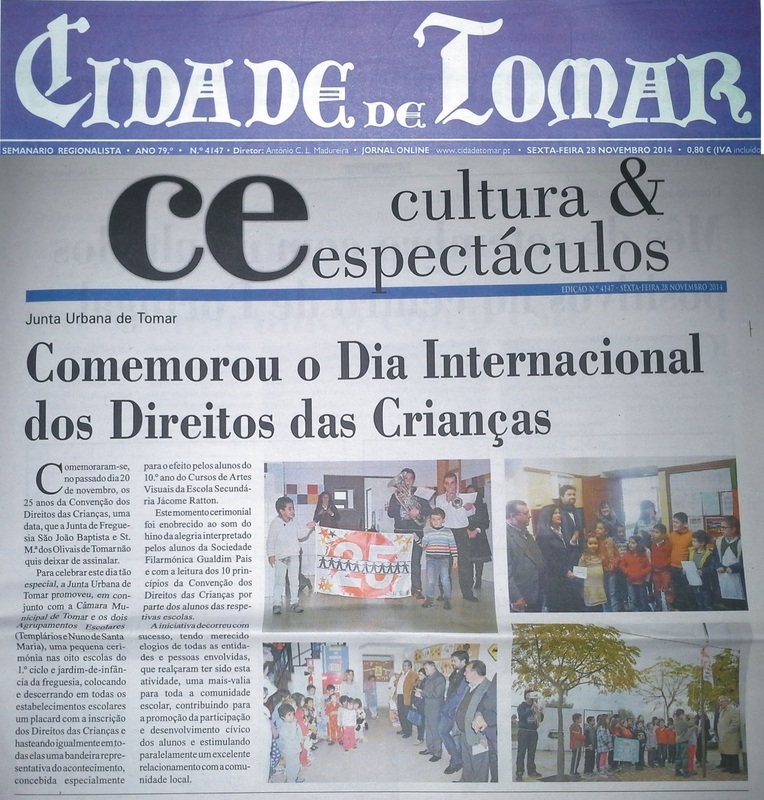 City Hall and Local Health Authotities gave their support. All schools created their own posters and they paradd through the city, gathering in the main square. 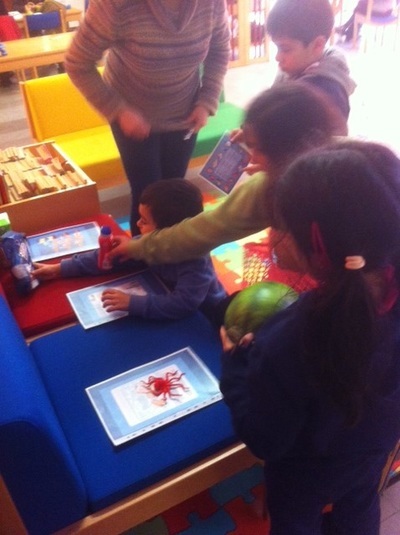 The images tell the story! 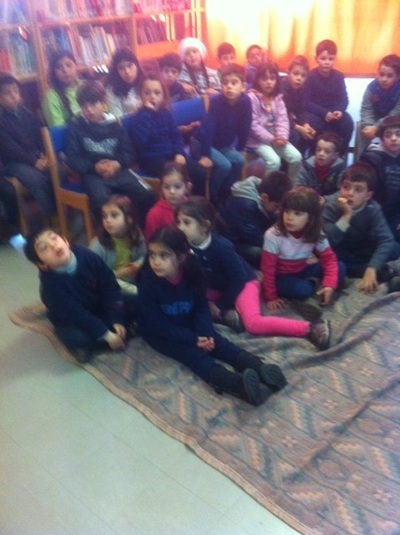 In the begining of the video we may listem to the words of our Director and Lady Mayor. 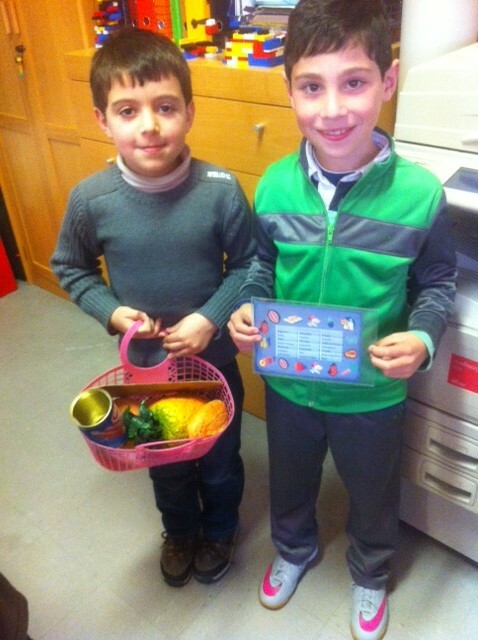 In early May, 1st grade pupils of Templários School spoke about their preferences for a work of partnership under the theme of MY FAVOURITE PLACES AT HOME. 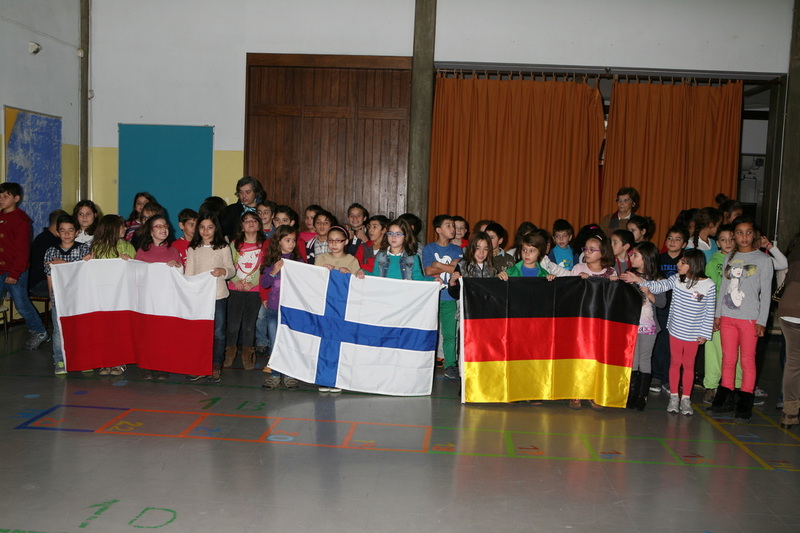 This work was organized by the swedish partner with everybody's contributions. Given some VERY particular aspects of our school, we decided to exchange home for school. 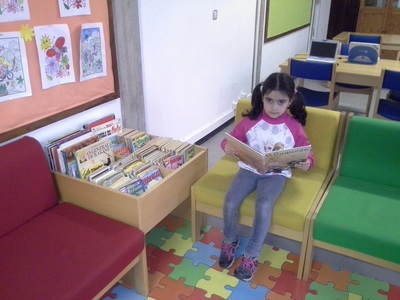 Here you may see the result of the portuguese, either on the photos of the most wanted places in school for each pupil or the texts they wrote and might be downloadable. 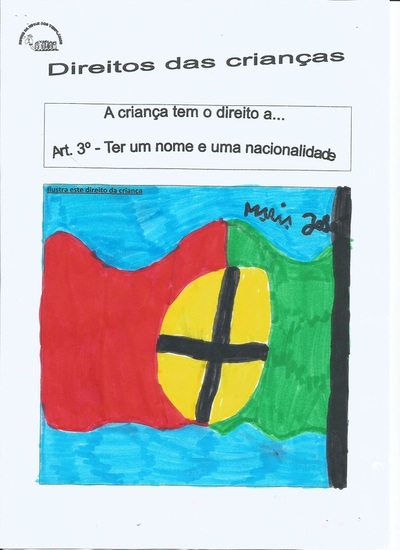 The puplis of Templários school organized an album of some main portuguese tradition, from north to south to send to their fellos in Sweden. 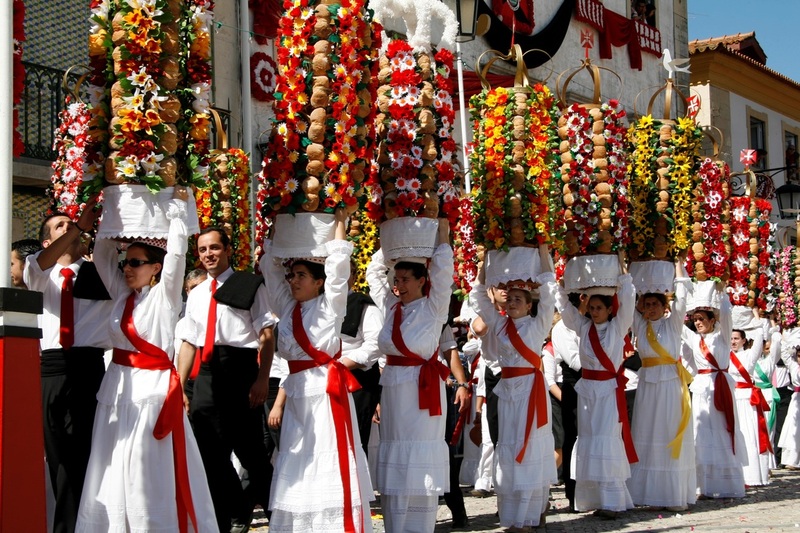 Here under you may see the pictures of those traditions. 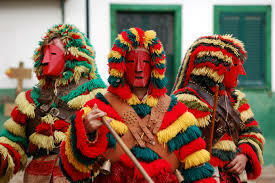 The game is for you to try to identify those traditions. 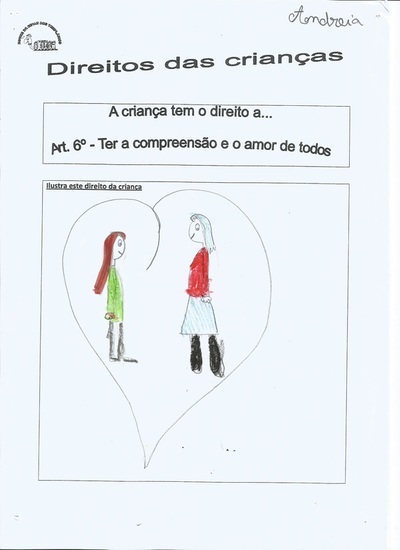 If you cannot, download the file and learn.